Dear friends! I decided to inform you about important information, as well as to assess the ongoing developments. What happened yesterday was not our choice. It was the one-time and adequate response to that conspiracy which took place against Georgia, Georgian democracy – I stress – an attempt of overthrowing constitutional order, the steps taken against Georgia’s democratic system. Yesterday, we protected not the government, but I want everybody to understand – yesterday we protected Georgian democracy, Georgian society, yesterday we protected Georgian statehood. I want everybody to understand that this was the first case, when not the government and the state asked the people for protection, not the government and the state took people out in the streets, but the government took all adequate steps to protect the population from disorders, attempts of staging disorders, attempts of overthrowing the constitutional order. What happened in Tbilisi yesterday was very similar to what happened in Vilnius in 1991- I mean a putsch inspired by foreign forces – what happened in Georgia at various stages and what happened in Estonia several months ago. I want everybody to understand that when someone challenges public order, when someone challenges law enforcement agencies, this is violence. The monopoly on use of force, in frames of law, belongs only to the State. [The State] should maximally avoid use of force, especially use of excessive force. I want everybody to understand that what happened yesterday was not only a local, isolated unrest. It was a scenario prepared for many months and years ago, with the participation of foreign elements; we have this evidence and we have already unveiled part of this evidence. I want everybody to understand that the flag of Georgia is red and white with five crosses and those, who were flying other flags, trying to change the Georgian authorities and the Georgian system with these flags, the state will protect itself from them in future through all the means at its disposal. Our positions, our chairs, or any privileges accompanying these chairs and posts do not cost anything for us. We have no other concerned, rather than Georgia and maintaining order in Georgia. I want also to say that these developments have achieved a goal which we wanted to avoid – shadowing Georgia, shadowing its progress and our international positions, shadowing further development of Georgia. Of course, we have definitely suffered from it. This is just that damage, which we wanted to avoid, most of all. I also want to say that we were pushed to hold elections in spring, when it is absolutely inadmissible. Therefore, I decided and I have a proposal to hold presidential elections on January 5, 2008. Let’s hold these elections without additional postponement. I, as the leader of this country, need an unequivocal mandate from you in order to tackle all the foreign threats, to tackle all types of pressure on Georgia, to tackle attempts at annexing Georgian territory, to tackle plans directed towards destabilizing Georgia. So I propose that you judge and give me your trust and your support for the country’s further strengthening and to show the entire world that the Georgian people can maintain unity despite attempts at destabilizing us. So, my dear people, did you demand early polls? You have received even earlier ones. Did you knock on the door of democracy? It is open, because I, as the president of the country, am a guarantor that this door will never be closed. But, these [snap] elections will, however, be held according to our timing and not that of our ill-wishers. So these elections will give us an advantage ahead of the elections in Russia. So, the elections will be held under that very vision, which was offered by me and which, unfortunately and shamefully, was not understood by some political groups and the representatives of these groups. We do it because we are protecting not our government, but we are protecting our country. And my compromise is that I give you [referring the opposition] a chance to become people’s choice if you deserve it, as it happens under democratic conditions. And before someone starts accusing me of authoritarian or dictator style, I want to remind you that I am that President, who for the second time reduces his presidential term, the first presidential term and practically makes a decision, similar to which had never been made in the region and even in most other countries. I am doing it to stress that months and years do not mean anything, when the matter is about the major, vital interest – to show to the entire world that Georgia is a strong democratic country, the people of which has an absolutely exact imagination about its firm future and the guarantees of its firm future. I want to stress again that I am reducing the term of my presidency for the second time already in order to demonstrate people’s will. I know the price of democracy, but I also know how to struggle against a huge machinery of lies, which has been put into operation against Georgia – democracy and protection of truth do not exclude each other; on the contrary. I do not want Georgia to be a country, where there are certain restrictions on democracy, where the state of emergency is imposed because there is danger of coup and turmoil, where restrictions are imposed on media outlets, because mass media directly calls for violent overthrowing of the authorities. I want to be the leader of the united nation, which believes in victory. I want to be the choice of this nation, but you should make this decision. I want to say that it will be the most democratic, most free, most transparent elections during my presidency for past four years. Now, I call on international organizations and international institutions to send as many observers as possible. The state of emergency will be lifted in Georgia in few days, because the situation has been stabilized very quickly due to very vigorous actions of our law enforcement agencies. It means that all restrictions on the activities of various political groups will be cancelled along with the cancellation of the state of emergency. At the same time, in order to remove all questions regarding the parliamentary elections – the presidential election is my prerogative – but as for the date of the parliamentary elections, under conditions when we think that these elections should not be held simultaneously with the elections in Russia, I want that we hold a plebiscite, simultaneously with the presidential elections, where the Georgian people will answer to the question: when they want elections, in spring or in autumn next year. Do not let the political groups, which are shouting a lot to decide this. Let it be your – the main owner of this country, Georgian people and Georgian society – who will solve this issue. Within past months, when the factory of lies and unrests was put into operation at its full capacity, Georgia appeared in front of two most difficult tests: this is a test on firmness and endurance and a test on democracy. I want to tell you that we have passed a test on firmness excellently, with impressive results. This test of endurance was passed by the Georgian society; this test of endurance was passed by Georgian political elite, which demonstrated impressive consolidation. We have preserved parliamentary majority during four years. We have preserved a firm link between the parliamentary speaker and the President. It happens only in few countries. It means that the strength is in our unity and we understand it well – both the society and the absolute majority of political ruling group. And this is sign of Georgia’s firmness, democracy, openness and at the same time, a clear sign of precise understanding. We still have to pass the second test on democracy and we will pass this test. Georgia’s force is in passing all tests. We tackle all the challenges commendably, although many people may be surprised with it; we have overcome even more difficult standstills and we will become much stronger. This entry was posted on ხუთშაბათი, ნოემბერი 8th, 2007 at 8:07 PM and is filed under 1, სხვა..., ქართული ტელევიზია | TV, ქართული | All. You can follow any responses to this entry through the RSS 2.0 feed. You can leave a response, or trackback from your own site. mishaze shezizgebuli, Shena xar avadmkopi da gchirdeba psikiatriuli daxmareba! Misha ki ar cava, is mova da shenistanebs karg psikiatriuli daxmarebis pirobebs sheukmnis. MIXEIL SAAKASHVILI ARIS SAKARTVELOS AXALI PREZIDENTI ! 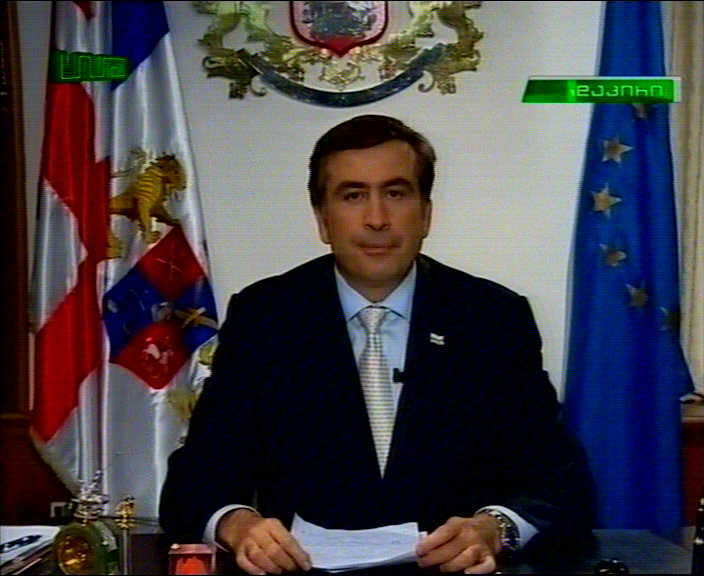 SAAKASHVILI IS A NEW PRESIDENT OF GEORGIA!